A paper's grain direction is a factor in folding and binding. For any type of paper a fold parallel to the grain direction will always be better than one against the grain direction. Grain direction is determined on the paper machine. As the fibers come together, they align in the same direction that the machine is moving. Then, when the paper is sheeted from a paper roll, or subsequently cut down from larger sheets, the grain will either run parallel to the long dimension of the sheet (grain long), or to the short dimension (grain short). 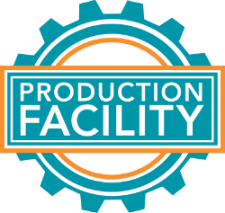 In both printing and in envelope folding, the grain direction is an important consideration for folding, registration and binding operations and can have a noticeable effect on the quality of the envelopes being produced. Most envelopes are straight grain. Envelopes are laid out on a sheet of paper to maximize efficiency with the least waste. Consequently, in any given run of envelopes there may be some finished envelopes that are short grain and some that are long grain. This will be more noticeable in envelopes made from papers with a linear texture. Envelopes may also be specified as diagonal grain. 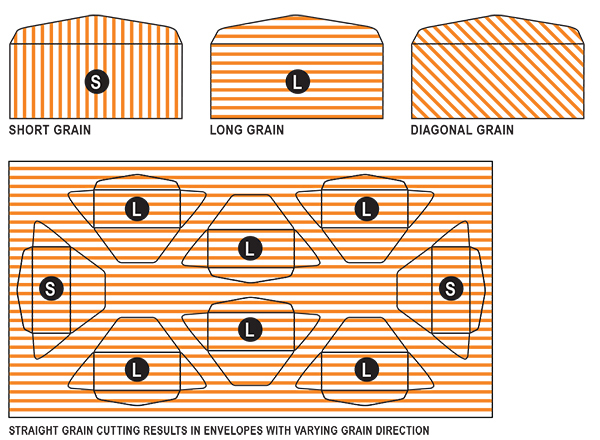 Diagonal-grain cutting results in more envelopes per sheet, however, these envelopes can be prone to warping and may be more difficult to run through automated equipment.